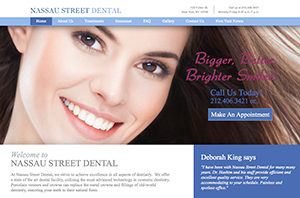 Design Burd Inc.A Design to Smile About | Design Burd Inc.
We've redesigned a whole new custom WordPress website for Nassau Street Dental! The large images across the home page draw you in to big, inviting smiles that lead you to contacting Nassau on this easy-to-navigate website. We've integrated social media, and social media campaigns. We've also built in a customizable testimonial tool for our client can update themselves. Take a look, and see the why Nassau is a great place to make an appointment.